Vancouver Island beggarticks is an annual wetland member of the aster family (Asteraceae) with a very restricted range in North America. Once thought to be endemic to southwestern British Columbia, it has recently been found in Washington State (Ganders et al. 2003). Plants are erect and branched, 0.5-1.0 (1.5) m tall, with stalkless leaves that can be simple, tri-lobed, or partially lobed.. Flowers are 'daisy-like' with yellow ray flowers. When in flower, this species resembles nodding beggarticks (Bidens cernua). Vancouver Island beggarticks is found in the moist edges of marshes, in bogs, along stream and river banks, in pond edges and in ditches. Populations are susceptible to infestations of the beetle Calligrapha californica coreopsivora, a species favoured by cranberry growers because it feeds on weeds in cranberry fields (Hartwell pers. comm. 2009). In his rare plants of the Fraser Valley article, Lomer (2011) says: "This confounding and variable species is present in the Fraser Valley from Delta to Chilliwack. The Fraser delta contains plants that are morphologically confusing. These are rather tall slender estuary plants with long petioles and long achenes bearing long awns (UBC: Lomer 6765). It appears that the slender habit is largely an environmental response to constant tidal inundation, while the long fruit, over 2 cm long, is genetic. Dozens of fruits were collected from Fraser estuary plants in Richmond and the longest fruit bodies averaged 13 mm and the awns averaged 8.5 mm. The longest fruit body was 17 mm and the longest awn 10 mm. These fruit traits held when plants I collected were grown under garden conditions in my front yard. These Fraser estuary plants with the long fruit appear to be a unique form of Bidens amplissima. Genetic testing is needed to confirm their true identity. If we take these estuary plants into account as part of the variation within the species, then Bidens amplissima may be more widespread than reports indicate. These estuary forms can be found north to the Kimsquit River near Bella Coola (V: C. Clement 8327) and, perhaps, south to the Columbia. Further collecting is needed to confirm the species' full range." Extracted from Botanical Electronic News #432, January 2011, with permission. Annual herb from a fibrous root; stems ascending to erect, glabrous or nearly so, branched above, 0.5-1.0 m (1.5 m) tall. Basal leaves lacking; stem leaves opposite, unstalked, or the lower shortly wing-stalked, the lower and middle deeply 3-parted, sometimes most or all leaves simple in a population coarsely toothed or incised, glabrous, 8-20 cm long. Heads with ray and disk flowers, few, in a terminal cluster; involucres about 2.5 cm wide; involucral bracts in 2 dissimilar series, the outer ones about 8-10, leafy, fringed with small hairs, linear-lanceolate with entire margins, up to 7.5 cm long, the inner ones narrowly egg-shaped, 8-12 mm long; ray flowers 8-11, yellow, 3.5-8 mm long; disk flowers yellow. Achenes wedge-shaped, compressed-quadrangular or nearly flat summits concave, sometimes nearly flat, not thickened, 5-7 mm long; pappus of 2-4, retrorsely-barbed awns, 2-4 mm long. Cronquist (1955) suggested that morphologically, Bidens amplissima may represent a hybrid between B. cernua and B. frondosa or B. vulgata. Recent work by Ganders et al. (2000) shows that its ITS and isozyme similarity to B. cernua and B. tripartita suggest it is a recently evolved species. The following three Bidens species are most easily confused. The following key was developed to aid in identification of Bidens amplissima and to separate it from the two similar species (Ganders et al. 2003). Source: Modifed from Ganders et al. (2002). Moist to wet ditches, streambanks and pond edges in the lowland zone; infrequent in SW BC, known from Vancouver Island and the adjacent mainland; endemic to BC. View a comparison photo of the seeds of Bidens amplissima and Bidens cernua. This species can be confused with Bidens cernua and Bidens tripartita. B. amplissima is readily separated from B. cernua, which has cartilaginous and concave achene summits (achenes broadest at the summits), globular flower heads, and more numerous petals than B. amplissima. While B. amplissima grows on pond margins, B. cernua is frequently found in deeper standing water. B. amplissima is also readily separated from B. tripartita, which can be very similar in appearance. B. tripartita; however, lacks the ray petals that are typical of B. amplissima. Hybrids do occur, and often populations are a mix of species and hybrids. Ganders, Fred R., Brian Klinkenberg, and Rose Klinkenberg. 2003. Taxonomy in Conservation Biology: The Enigmatic Vancouver Island Beggarticks. Davidsonia 14 (3): 63-70. Ganders, Fred R., Rose Klinkenberg and Brian Klinkenberg. 2002. 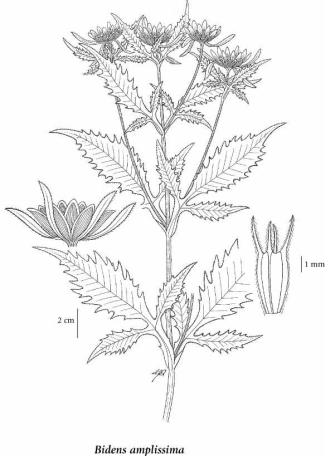 British Columbia loses an endemic species: Bidens amplissima (Asteraceae) also occurs in Washington State. Botanical Electronic News. 293 (July 2002). Hartwell, Sharon. 2003. Personal communication. Email.